I currently have 4 dogs but I’ve had dogs my whole life. I’ve also fostered 20 – 30 more dogs over the years to boot so when it comes to dog products, I’ve tried them all and then some. I’m going to share my favorite dog beds with you right now and tell you why I like them. It’s not going to be a long list because frankly, a lot of dog beds don’t hold up over time. Anyone can get a dog bed, throw it on the floor and say “It’s great!” But these are beds that I’ve had in my home for years and I’m still very happy with them. They’ve lasted all the seasons, diarrhea, puking, surgeries, illness, foster dogs, my nieces and nephews laying in them and more. The Derstadt Elevated Pet Bed is great for inside or outside. They are raised off the ground so if it rains or the sprinklers hit them, they dry fast. They stay cool since air can flow above and below them, making them great for outside on a hot day. I have three of these dog beds. I keep one outside but I keep the other two inside and pile them with pillows and blankets for extra comfy cuddly snuggle time. It’s so easy to clean below them since they are elevated off the ground, you can either slide it over or just reach a broom right under neath and get all that dust and dog hair out of there. My dogs love it. Another great feature is the price. You can get a large dog bed for under $25 and they are very easy to assemble. They are very light weight and travel well, you can take them apart, roll them up, put them in bag and then reassemble them when and where you need them. 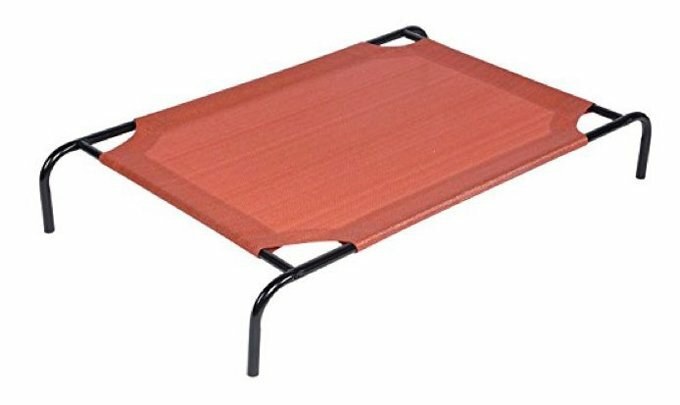 If you like to camp or take road trips, this is a great dog bed that won’t take up much space and can go anywhere with you. They also come in several colors so you can pick the color that goes best with your home. Cleaning is super easy, for me I just hose them down if they need to be cleaned and let them dry in the sun. They dry in just a few minutes on a warm day. BONUS: This bed may be lightweight but it’s strong. 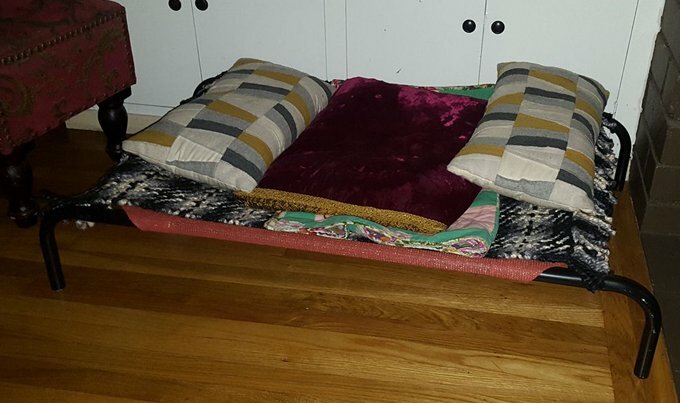 I can’t tell you how many kids (nieces and nephews and friend’s kids) have come to my house and treat this dog bed like a trampoline and none of them have ever broken. (Knock on wood) Of Course I wouldn’t let any kid jump on this dog bed because it’s dangerous and clearly not a trampoline, but it’s good to know that they won’t just crumble if some kid does happen to step on it. I’ve been amazing at how well this dog bed has stood the test of time. Another bed I love is this PetFusion dog lounge. A lot of beds have come and gone in this house yet this bed remains for a reason. It’s made of memory foam so it keeps its shape and doesn’t go flat. My dogs love resting their heads on the raised sides. The bed is water resistant and the cover comes off for easy washing. The memory foam is great for my senior dogs who need something that is soft yet firm. My dogs are drawn to this bed and much like the pic on the website you can find more than one of my dogs curled up together in this bed together most of the time. Some of the other memory foam dog beds don’t have the raised edges, but this one does and that’s what makes it one of my dog’s favorites. This bed also has a non-skid bottom so it doesn’t slide around the room at night when we are sleeping. This is important for me because other dog beds that do tend to slide around on my wood floors in the coarse of the night can be dangerous. Two of my dogs are small and when I get up to use the bathroom I don’t want to accidentally step on a dog because the bed has shifted or moved around. I had a dog bed that would shift so much that by morning it was always way under my bed and the dogs couldn’t even reach it, so I really love the non-skid bottom. This dog bed is a little more expensive than some in the $120 range for the large and $70 for the small bed, which may be a little more than some beds but it’s so worth it. 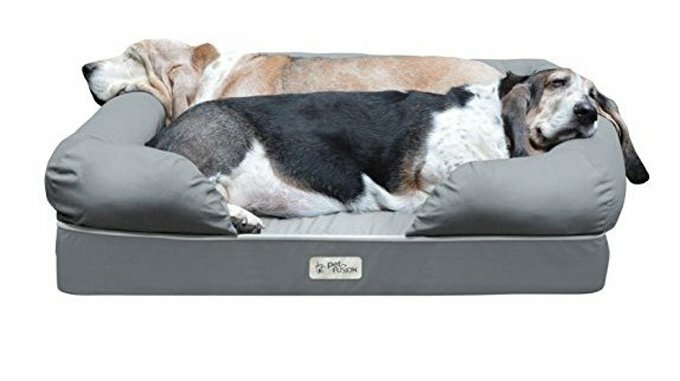 Some cheaper beds need to be replaced yearly, especially when you have 4 dogs plus foster dogs, but this bed is going on 3 years and is passing the test of time so well worth the money if you ask me. So there you have it. My two favorite dog beds. Both beds have passed the test of time and are still going strong. NOTE: I’m not a dog bed expert. I’m just a lifetime dog lover and owner so this is purely my opinion based only on the dog beds I have actually tried. I’m sure there are tons of other great beds out there so please tell me so I can try them!